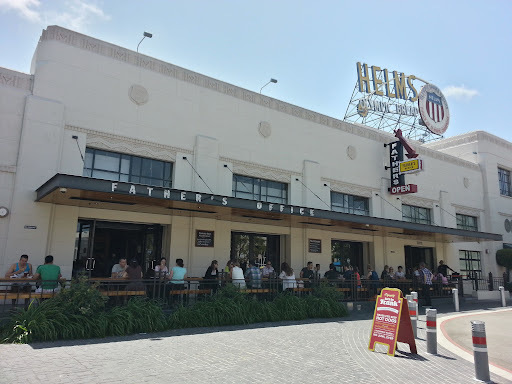 The burger at Father's Office is touted as "the best burger in LA". I had to check it out for myself. There are two locations, but both are 21+ only. So even during the day and for food only, its strictly for adults. Anyone under 21 is pointed to the to go menus. All orders are put in through the bartender then the food is brought to your table. 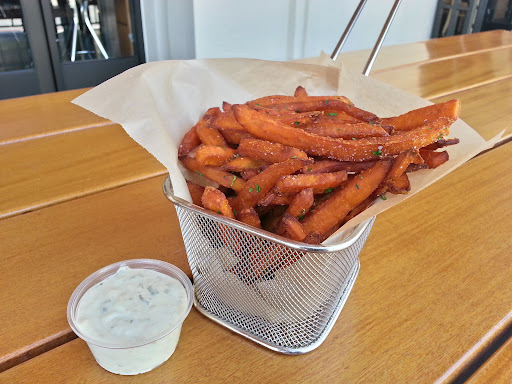 A lot of people rave about their sweet potato fries. They have a nice crust and a sweet fluffy inside. Not exactly the best ever, but solid sweet potato fries. Its served with a blue cheese dipping sauce. It wasn't the most traditional dipping sauce, but even though I'm not a huge fan of blue cheese, I found the flavor to be pretty good. Finally, the main event - the burger. The bun makes this burger look more like a hoagie or a sandwich. Its lightly toasted and layered with arugula, blue cheese, caramelized onions, and gruyere. The burger is juicy, but not oozing. The meat is tender and flavorful, but not jaw dropping fantastic. The taste of the burger is very sweet, which is from the very generous portion of caramelized onions. While its not the best or most traditional burger, its still a good burger. Nopa's burger in SF (see post HERE) outshines this burger by far. Another ho hum dish - the bone marrow. Again, with the sweet flavors! The bone marrow, while fatty, was also a bit on the sweet side. Nothing too memorable about this dish either.